and head north with my girlfriends (except we were really missing Lacie!!) last weekend. Not that we really need an excuse to get together, but our reason this time was to celebrate our birthdays in one fell swoop. No gifts were exchanged, just the gift of time together sharing laughter, God's word, and cheesecake. Priceless! Friday afternoon we hit this place first. Have you been? I hadn't been before and look at my reaction... (besides my horrible posture, I look like I'm one step away from a Boniva commercial). It's the hugest warehouse store filled beyond comprehension with cheap handbags, jewelry, accessories, oh...and hair (yes, I couldn't resist trying some on). We ended up spending close to THREE hours there, can you believe it? We all found a few pieces of jewelry that we could not live without, most of it rather large and chunky, therefore CHUNK became our word of the weekend (more on that soon). Go chunk or go home. After fortifying ourselves with coffee and checking into our hotel, we ventured back out to the Market Street shops. Many of them were pure eye candy since the prices were well above our budgets, yet still entertaining and enjoyable. 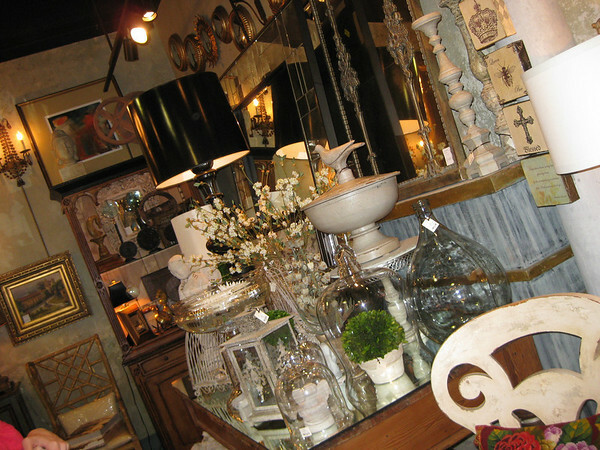 My jaw dropped when we entered Maggie's which was a total high-end frou frou shop, but highly pleasing to the eyes. 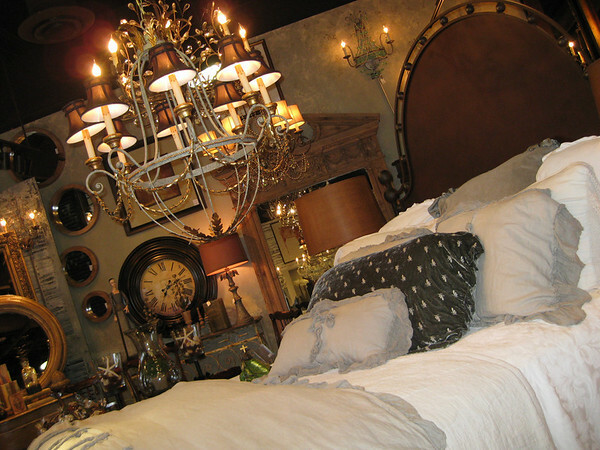 Isn't this bed divine? I could see our cats lounging in high style, can't you? Then my jaw dropped again when I saw all the mirrors, apothecary jars and glass domes on display. SO pretty. But I wouldn't want to dust all that. We browsed and drooled through the shops for a while longer, then made our way over to the mall. I know. It was delightful to browse without a time limit, no little people and no husbands perfecting the art of sighing and checking their watches not too discreetly over in the corner. Not that mine does that or anything. I went inside an Anthropologie for the first time. I know, where have I been? 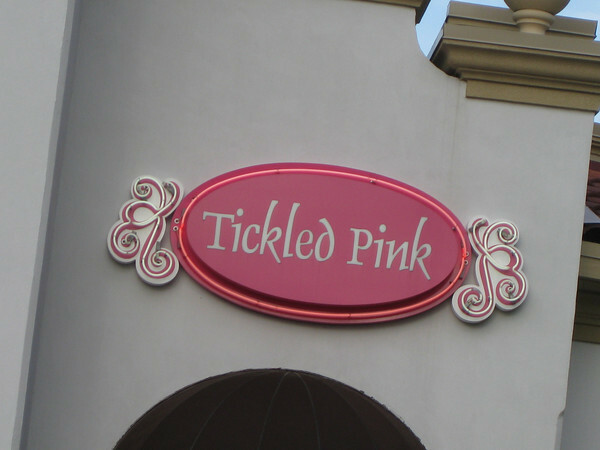 Loved everything, drooled a lot, wondered who actually buys things there ($$ cha-CHING). Supper was a delicious chopped salad at The Cheesecake Factory and of course, cheesecake. Three of us were fully prepared to order four slices of cheesecake and then eat it buffet style, one of us spoke with reason and moderation and convinced us two slices would be more than plenty. Turns out, she was right. Back at the hotel, we got in our jammies and did our first bible study lesson. There were three lessons in all based on Ephesians 3 and the theme of God's Measureless Love. We were reminded to give a CHUNK of our time filling ourselves up with God's word and memorizing a CHUNK of scripture at a time. Sadly, since it was past midnight when we started, I was sitting on a comfy bed and I was in my jammies, I fell asleep halfway through the first lesson! Whoops! I have some homework to do. Saturday morning we slept in, got ready at our leisure, then completed the second lesson before checking out of our hotel. A perfect morning! 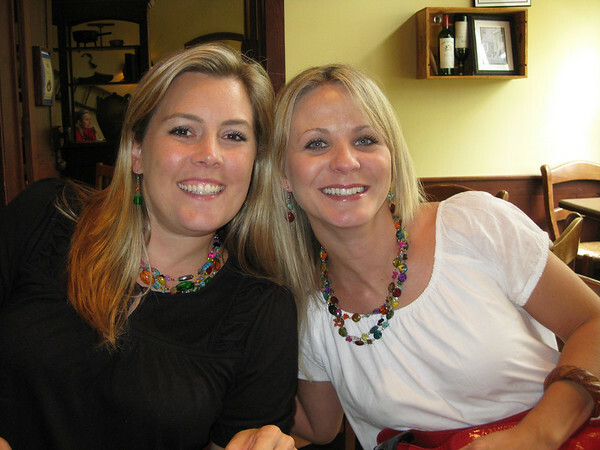 Kim and of course, moi, showing off our new CHUNK-y jewelry. (for some reason I don't have a picture of me with a bra on my head, sorry). After all that, it was time for a refueling of iced coffees and frapps. Divine. We tried to do the last lesson both inside and on the patio of Starbucks but it was too noisy and too stinkin' hot. We took advantage of Borders' A/C and casual hang-out policy and Heather set up her laptop on one of their tables and we were in business. Later they asked us to move so we wouldn't block the aisle, but overall they didn't mind us doing a bible study in one of their corners. Cool. We finished off our fabulous weekend with supper at, you guessed it, The Cheesecake Factory. Again. It was crowded, and we were hungry, so when faced with the choice of a 45 minute wait or to sit immediately on the patio, we chose the patio. Things were just peachy until the inebriated guy behind us, barely six feet away, um...barfed. Nice. Remember though, this was the weekend of the CHUNK, right? Yep. Our coolicious waiter, Tom, hooked us up with a table inside in a jiffy, so it was all good. And we got to enjoy the A/C after all. And two more slices of cheesecake. Can you guess what flavor one them was? Snicker Bar CHUNK cheesecake. For several reasons. I love it all! What a great way to spend a weekend. It sounds like you all connect on so many levels, from the spiritual to the "chunk!" I love ALL the eye candy!!! It is so good to see yall happy and enjoying the weekend! God is so Good! 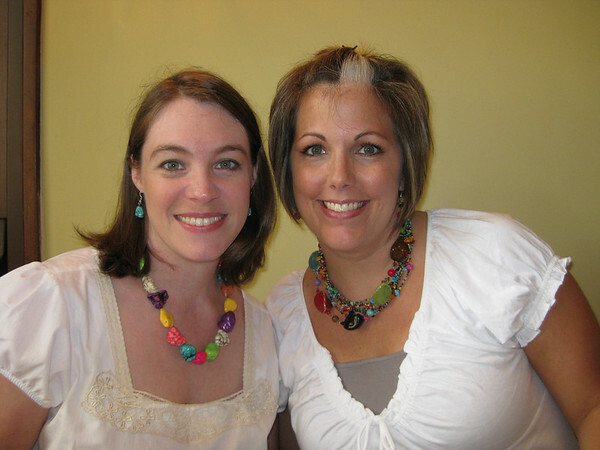 Love the chunky necklaces and that you studied God's word together. What a great weekend! It's too bad Lacie couldn't be there though. It's so funny that CHUNK was your word for the weekend. 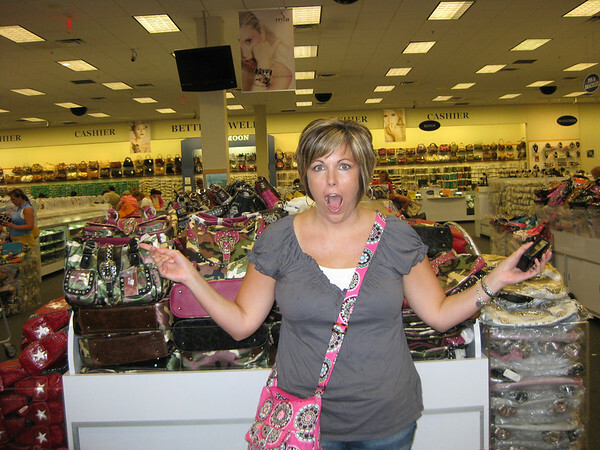 I love it that you spent 3 hours in the purse store (emporium really) and that you went to The Cheesecake Factory twice! Getting fitted for bras twice is pretty funny too. Did your sizes end up the same in both stores? I love this line, "I'm sure the sales ladies thought we were off our meds and out on a day pass." You and your girlfriends have so much fun together. How much do I love that your getaways have a theme? So fun! What fun! I need a girls' weekend like that (minus the barfing guy, of course). Love the chunky jewelry! Y'all are too cute! Child child child.....this is great. I love it that you guys had such a good time. I know yall missed Lacie though. 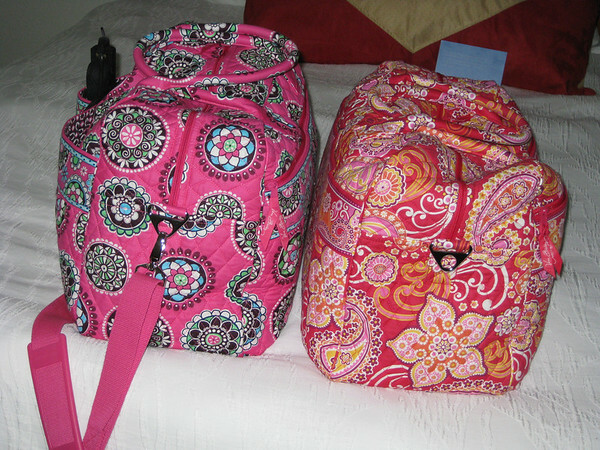 I do love your Vera and admit to a little lust over it. And the CHUNKY jewelry. Sam***Moon is on my to do list. I'm planning it very soon when it cools down to at least a 100. Heard the Bible study was wonderful so I think I need to get it and B, T, and I need to watch too! LOVE YOU. My dear friend - you have a way with words! Can we go back and re-live it all (minus the barfing) and with Lacie...like, next weekend? Love you! I am with Kim...LETS GO BACK! It was such a wonderful, relaxing and uplifting weekend! I loved every minute...except smelling the barf. LOL!!! <3 u! What a wonderful time with sisters. I'm so glad yall got to go and enjoy time with each other. I want to be one of your friends. Sounds like the perfect girl weekend. I'm ready to go back right about now too!! I'm certainly blessed by these girls! Were you in DALLAS!!?! And I'm not there!?? Next time, call. Hopefully, I won't be in Utah. I am going to have to check out those shops. So cute. 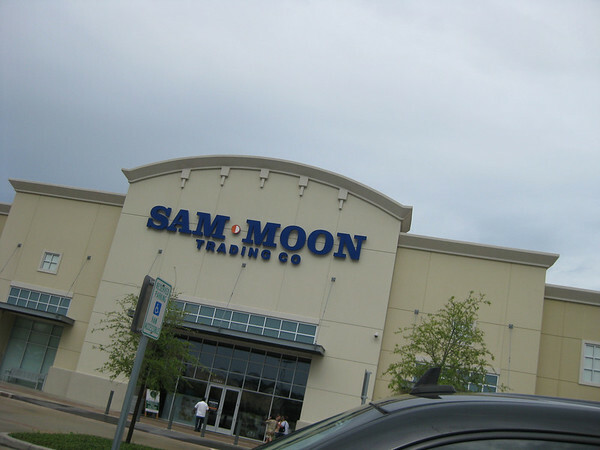 We have a new Sam Moon 5 minutes from my house. Heaven! Rochelle: No, we didn't make it THAT far north. :) We were in the Woodlands area. I'd love to be that close to a Sam Moon--then again it might be too dangerous!